01:01 | Deputy prime minister General Prawit Wongsuwan yesterday said that no special security measures are planned for a rally by an activist group on May 5 calling for an immediate general election, adding that he did not think the gathering will last for long. 02:06 | Internal Security Operations Command (ISOC) spokesperson Major General Peerawat Sangthong said on Wednesday that officers will be monitoring developments and standing ready to intervene if any undesirable situations occur during a planned rally by an activist group on May 5. 03:28 | Minister attached to the Office of the Prime Minister (OPM), Suwaphan Tanyuvardhana, will meet with groups opposed to a housing project for court officials and judges on the slopes of Doi Suthep in Chiang Mai on May 6. 04:35 | The government-appointed committee tasked with directing integrative strategy on the promotion of the Philosophy of a Sufficiency Economy held its first meeting of the year on Wednesday and approved the framework needed to carry out its tasks in accordance with the 12th National Economic and Social Development Plan (NESDP) and the 20-year National Strategy. 05:50 | The National Anti-Corruption Commission (NACC) has handed awards to 12 winners of a competition to produce an educational program on public participation in the prevention of corruption. The anti-corruption course has been implemented since 2014 at the vocational level. 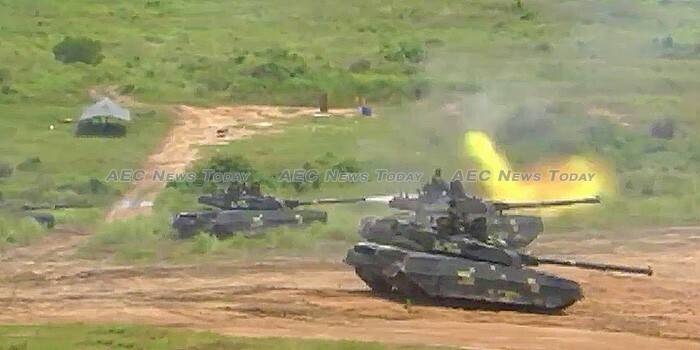 06:52 | The Royal Thai Navy (RTN) has held a live fire training session with other factions of the military at its number 16 training ground in Khao Kitchakood District of Chanthaburi Province in eastern Thailand. Held under a beachhead scenario, the exercise included tanks, helicopters, and ant-aircraft guns. 07:43 | The Public Relations Department (PRD) is holding a two day event to mark the 85th anniversary of its establishment under the title ’85 Years of the Public Relations Department, Creative Media In Step with the 4.0 Digital Age’. 12:42 | Bangkok officials and the Thai Health Promotion Foundation (THPF) have teamed up to spread the word about fire safety and how to combat fires. According to official figures 783 fires in 2017 were caused by short circuit, resulting in 28 deaths and 117 people injured, up from 11 deaths in 2016. 14:04 | The Department of Environmental Quality Promotion (DEQP) has awarded plaques to 81 temples across the country for their excellence in environmental management. Among 114 entries in the 2017 programme, 22 were judged excellent, 25 as very good, and 34 as good. The programme begun in 2015, with temples serving as environmental role models for their communities. 17:16 | The Ministry of Foreign Affairs (MFA) and the United Nations Offices on Drugs and Crime (UNODC) have held Regional Conference – Asean 2025: Synchronising the Economic and Security Agendas. In a keynote address deputy prime minister and Justice Minister, Air Chief Marshal Prajin Juntong, said criminal activities range from the distribution of counterfeit goods to human, drug, and wildlife trafficking. Meanwhile, Transport Minister Arkhom Termpittayapaisith told the meeting that transportation infrastructure is the key to regional development, urging member countries to work on international transportation services and safety, in addition to interconnected technology and digital data for screening tourists. 19:46 | The Ministry of Justice (MoJ) is hosting the ‘23rd International Congress of the International Union of Judicial Officers’, the first such congress to be held in Asia. Designed to build confidence in the handling of civil trials and to validate the region’s economic and social status, the congress, which runs until May 4, has attracted more than 400 judicial officers from organisations representing over 50 countries. 21:19 | The Association of Siamese Architects (ASA) is holding the 32nd edition of the ‘Architect Expo’ showcasing Thai contemporary architectural designs, cutting-edge construction technologies, and innovations related to architecture, interior design, and landscape architecture. More than 400,000 visitors are expected at the event, which is taking place until May 6 at Challenger Hall 1-3, IMPACT Muang Thong Thani. Business matching sessions are expected to give the construction materials industry a Bt10 billion (about US$314 mln) boost in the latter half of this year, while informative speakers sessions give attendees the opportunity of hearing from industry experts.